This kit demonstrates the ability of solar power to be converted into mechanical energy, light energy, sound and current. Includes mounted solar cell with terminals, a miniature motor, buzzer and light emitting diode mounted on a 8" x 5. Sun Spot Solar Oven - Gain first-hand experience with solar radiation using this Solar Oven. Oven has reflective surfaces that concentrate heat radiation in the central chamber, resulting in temperatures up to 350 degrees. The Solar Cockroach is a little bug that uses the solar energy to power a vibrating motor. The vibrations from the motor travel down the legs, causing the bug to scoot around. These little vibrating bugs are essential tools for teaching beginning soldering lessons to students and adults of all ages. This project also offers a lesson in solar energy, motion, and vibration. Simply place the completed Solar Cockroach in the sun and watch it vibrate and scoot around! Pack of 25 Solar Cockroaches. This item has a flat rate shipping of $10. Demonstrate the extraordinary power of the sun by concentrating solar energy with this 12" diameter parabolic dish. Using its reflective mirror, the furnace can generate extreme temperatures to heat materials placed in the attached copper receptacle. Create your own computer controller dual axis solar tracker in under and hour, using only a screw driver. The sun is awesome, and so is solar electric power generation. Unforately for solar panels, the sun moves. To counter this you can make a tracker that follows the sun and allows for even greater energy production. We accomplish this by using two micro servos, four sensors, an Arduino Uno, custom laser cut wood, and a whole lot of screws. By popular request we designed this project to be non soldering, and all you'll need are some screw drivers and a wire stripper. 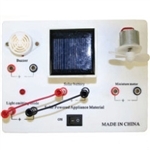 Comes with a very handy Solar Cell and Volt Meter to gather solar data for use in projects and experiments. Please note the production time of this product. Please contact us if it is a rush situation. Note: This product has a flat shipping rate of $12.